To deliver awards to individuals or organizations who were nominated by their peers for sharing aloha daily. What started out as our lifestyle brand simply mailing out stickers to the 50 states had developed into something more significant than even its previous campaign of collecting cap-wearing photos from 99 nations. Nominations were collected between August – December of 2019. 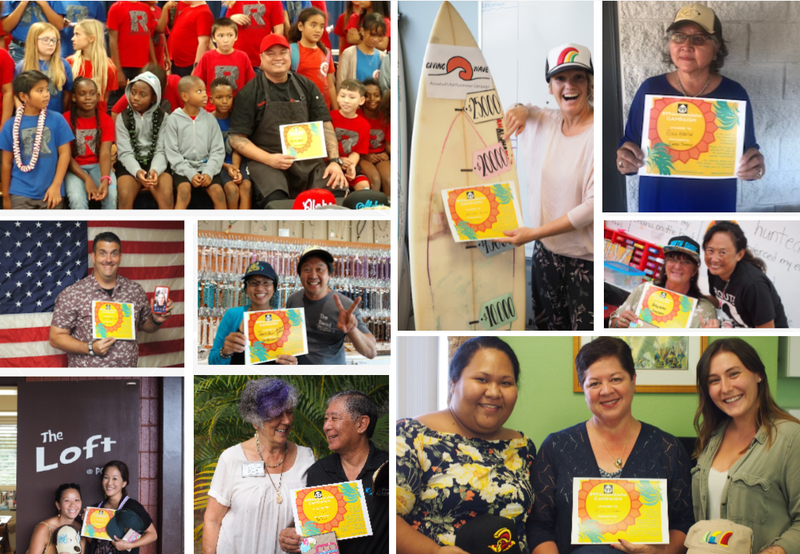 Ninety-nine awards were documented — with the vast majority of them being hand-delivered or mailed out to the neighboring islands or the mainland. Awards were accompanied with a hand-written card explaining why they had been nominated. Some were short: one or two sentences. Some were paragraphs long. I delivered awards to Laie — where fresh food was being handed out from a family’s garage; drove to Pokai Bay (on the Leeward side) — where stand-up paddle lessons were free for the public; visited six schools ranging from an elementary classroom to a charter school slated to open in the Fall; mailed awards to three neighbor islands, a dozen mainland states and two Anglo-speaking nations. This is the first in a series of articles for Makai Magazine, submitted monthly, that will share some interesting trends I observed. that our Award Recipients were young and old, conservative and liberal, female and male, as were the nominators themselves. One other obvious reaction I saw was just how meaningful it was to recognize another human being for their making a difference in someone else’s life. I hope you enjoy this series! Here is teaser of what’s to come! Don’t Know where to start giving? Community-based organizations matter! On how saying mahalo to family & friends is always powerful!